I've investigated to the best of my ability but I'm not really sure what's causing the error. Any ideas? Thanks for giving OSWeb a shot! 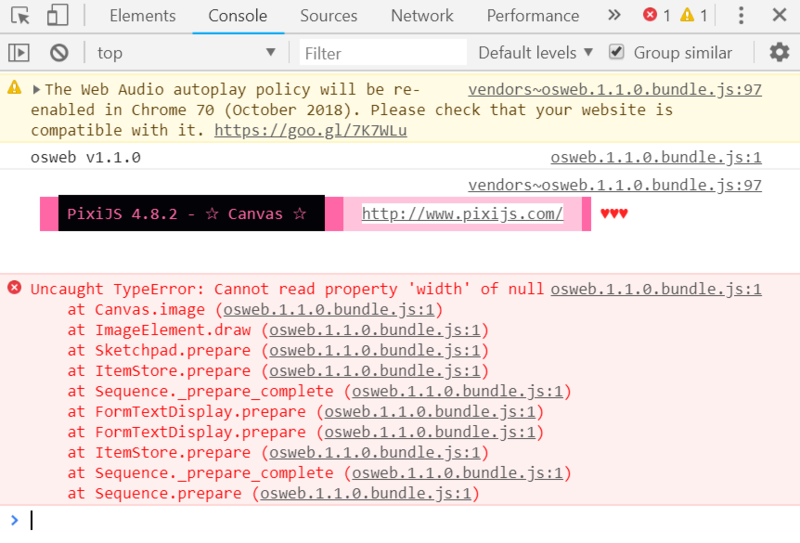 As you've probably seen (but just in case), OSWeb is still under development so we don't recommend using it in production. But of course we're keen to fix any bugs. Regarding the crash. Only a limited number of items is supported by OSWeb, and the form_text_display isn't one of them. However, that doesn't seem to be the only issue, because the error persists even after removing the forms. I'm pinging @Daniel to see whether he can shed some light on this. I'll have a look at this soon! The culprit was the file extensions of the image files in the pool being uppercase. This caused them to not be correctly recognized and processed as images. I made the extension check case-insensitive and now the experiment runs nicely, in my browser at least. Thanks very much for the help @Daniel and @sebastiaan ! That seems to completely fix the issue. One quick question: How would you save the acquired data? I've noticed that there is output in the console but is there a more elegant solution other than saving the console output? That seems to completely fix the issue. How would you save the acquired data? I've noticed that there is output in the console but is there a more elegant solution other than saving the console output? Perhaps this is some issue with what is being passed to the write function? There was a bug with Python 2 in the extension. I just pushed a bug-fix release to PyPi (1.1.2.1). Could you try updating and see if this resolves this issue?